Posted in Israel, Israel and International. In response to unceasing rocket and missile fire on civilian centers in Israel, on July 7, Israel launched a military operation, codenamed “Operation Protective Edge”, targeting strategic Hamas facilities, tunnels, weapons and leadership. On July 17, following days of unceasing rocket fire, Israel expanded its military operation by sending IDF ground troops into Gaza in order to destroy Hamas’s infrastructure, including rocket storage sites and tunnels which cannot be destroyed by aerial attacks. Hamas smuggles rockets and other weapons into Gaza through its tunnels, and uses them to infiltrate Israel with the intention of killing and kidnapping civilians and soldiers. Since early July, over 2600 missiles, rockets and mortars have been fired from Hamas-controlled Gaza into Israeli cities and towns, including Tel-Aviv, Jerusalem, Be’er Sheva, Ashkelon, and even as far north as Haifa, a distance of over 85 miles from Gaza. At least three Israelis have been killed by rocket or mortar fire, and a number have been injured, some quite seriously. There has also been extensive damage to homes and other structures. The Iron Dome missile defense system has intercepted hundreds of projectiles fired into Israel, including missiles fired at Ben Gurion International Airport. Two-thirds of Israel’s civilian population (equal to over 200 million Americans) – Jews, Muslims, Christians and others – are now directly threatened by missiles from Gaza. In addition, Israeli security forces have stopped terrorists from infiltrating inside Israel from sea, over land and through underground tunnels. Several rockets have also been fired by terrorists from Lebanon, Syria and the Egyptian-controlled Sinai desert into Israel. On July 15, the Israeli government voted to accept an Egyptian-proposed ceasefire, which was supported by the US, the Arab League and others in the international community. As a gesture to Hamas, Israel halted air-strikes in Gaza for a few hours. Hamas in turn rejected the terms of the ceasefire, and continued to bombard Israel with at least 50 rockets during that period. On July 26, Israel agreed to a 12 hour UN-proposed “humanitarian ceasefire.” Following the the 12 hour lull in hostilities, Israel agreed to extend the ceasefire by another 24 hours. Hamas rejected the ceasefire’s extension. On July 17, at the request of the United Nations, a “humanitarian ceasefire” between Israel and Hamas went into effect for approximately 5 hours in order to enable Gazans to shop and resupply. While it was mostly quiet during the ceasefire, rocket fire from Gaza into Israel resumed almost immediately following the designated period. There are increasing calls by some world leaders, including President Obama and UN Secretary General Ban Ki-moon for an immediate ceasefire. The IDF aims to curtail Hamas’ ability to attack Israel – through rocket, missile, mortar attacks, and through an extensive network of underground tunnels, to ensure quiet and security for the Israeli population. The IDF announced that as of July 28, it has uncovered and destroyed 32 tunnels and over 60 tunnel shafts. Referring to the labyrinth of tunnels, Israeli military spokesmen speak of there being two Gazas – one above ground, and one below. The tunnels in Southern Gaza are used both to smuggle in weaponry from the Egypt-controlled Sinai into Gaza, and tunnels in Central and Northern Gaza allow Hamas terrorists to infiltrate Israel. For example, Gilad Shalit, the Israeli soldier kidnapped by Hamas in 2006 and held hostage for over five years, was seized from his base in southern Israel and taken into Gaza through a tunnel. During the current conflict, Israel has stopped a number of Hamas terrorists who have entered Israel through tunnels from Gaza. In one case, the Hamas operative was carrying tranquilizers and handcuffs, with the apparent aim of kidnapping Israeli soldiers. In addition, Hamas operatives have used tunnels to attack Israeli soldiers on the ground in Gaza. The extensive tunnel network cannot be destroyed through air power. The entire tunnel must be demolished through controlled explosions. (See IDF video of a tunnel operation here) Israeli forces are finding tunnels which begin under civilian homes. Some are booby trapped. Others are filled with explosives, telephone wires, food and other provisions. Israel has shown the utmost restraint in dealing with Hamas’s blatant hostility, and tried to stop the attacks through a variety of measures. 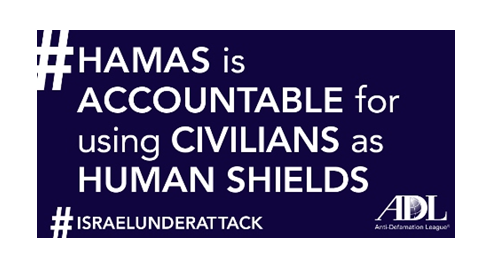 Israel has a right and a responsibility to protect its civilians from attack. No sovereign government in the world would stand by and allow its citizens to be under steady and heavy attack. In light of the unceasing attacks, Israel had no choice but to act against Hamas and its affiliates and eliminate its weapons caches and operational capabilities. Civilian injuries and deaths in Gaza are regrettable and tragic. Israel is doing what it can to avoid harming civilians and has launched investigations into certain incidents where civilians have been killed or injured. Israel has procedures to warn civilians though leafleting, phone calls and other methods, that their neighborhoods and buildings are located in the vicinity of military operations and urging them to leave the area. In response, Hamas has advised Gaza residents to ignore “Israeli propaganda” warnings and stay in their homes. Most of the targets chosen by the Israel Defense Forces are Hamas operational centers, storage facilities and rocket launching sites, the labyrinth of tunnels, as well as locations where terrorist leaders are hiding out. Many of the rocket storage sites have been deliberately located by Hamas in densely populated areas, including private homes, mosques and medical facilities. The psychological damage of Hamas rocket attacks cannot be minimized. When the alarm is sounded, no matter where they are or what they are doing – taking a shower, shopping for food, in summer camp, at a concert, in their car going to work – residents have as little as 15 seconds to reach shelter or risk being killed or injured. In the south of Israel, where the majority of rockets have fallen over the past 13 years, mental health professionals have documented the ongoing trauma experienced by children and adults alike. The ongoing attacks from Hamas-controlled Gaza have made absolutely clear the absurdity of the international community’s embrace and support of the unity agreement between the Palestinian Authority and Hamas. The time is now for the United States and other countries to pull their support of that agreement. US President Barack Obama strongly condemned Hamas’ rocket fire and tunnel attacks against Israel and reaffirmed Israel’s right to defend itself. The President expressed support for an immediate, unconditional humanitarian ceasefire based on the November 2012 ceasefire agreement, reaffirming the United States’ support for Egypt’s initiative, as well as regional and international coordination to end hostilities. The President underscored the enduring importance of ensuring Israel’s security, protecting civilians, alleviating Gaza’s humanitarian crisis, and enacting a sustainable ceasefire that both allows Palestinians in Gaza to lead normal lives and addresses Gaza’s long-term development and economic needs, while strengthening the Palestinian Authority. The President stressed the U.S. view that, ultimately, any lasting solution to the Israeli-Palestinian conflict must ensure the disarmament of terrorist groups and the demilitarization of Gaza. The US House of Representatives passed a resolution by unanimous consent expressing US support for Israel’s right to self-defense. British Prime Minister David Cameron strongly condemned the appalling attacks being carried out by Hamas against Israeli civilians. The Prime Minister further reiterated the UK’s staunch support for Israel in the face of such attacks, and underlined Israel’s right to self-defense. French President Francois Hollande expressed solidarity with Israel against rockets fired from Gaza. The President stated that it is up to the Israeli government to do whatever is needed to protected its population from danger. Canadian Prime Minister Stephen Harper reiterated Canada’s support for Israel and its right to defend itself against terrorist attacks. The State of Israel remains committed to a negotiated agreement with the Palestinian Authority. Hamas, an extremist Islamic terrorist organization, is firmly dedicated to the eradication of the State of Israel and is utterly opposed to any peace negotiations with Israel. Both the United States and the European Union have designated Hamas as a terrorist organization. The Hamas Charter is viciously anti-Semitic and echoes the notorious Protocols of the Elders of Zion charging Jews with an international conspiracy to gain control of the world. In Hamas’ world-view, Islamic precepts forbid a Jewish state in the area known as Palestine, and the Jewish people have no legitimate connection to the land of Israel. As its covenant proclaims, “The land of Palestine is an Islamic trust… It is forbidden to anyone to yield or concede any part of it… Israel will continue to exist until Islam will obliterate it…” To this end, the leaders of Hamas have denounced compromise with Israel as a betrayal of the Palestinian cause. Israel fully redeployed from the Gaza Strip in August 2005, uprooting Israeli settlers and removing military installations, in the hope that the Palestinians would govern Gaza responsibly and peacefully. Instead, the Hamas leadership has turned Gaza into an armed camp, creating and maintaining the conditions for a humanitarian crisis, and forcing the isolation of the Gazan population. Israel is ensuring that the flow of humanitarian goods into Gaza continues.